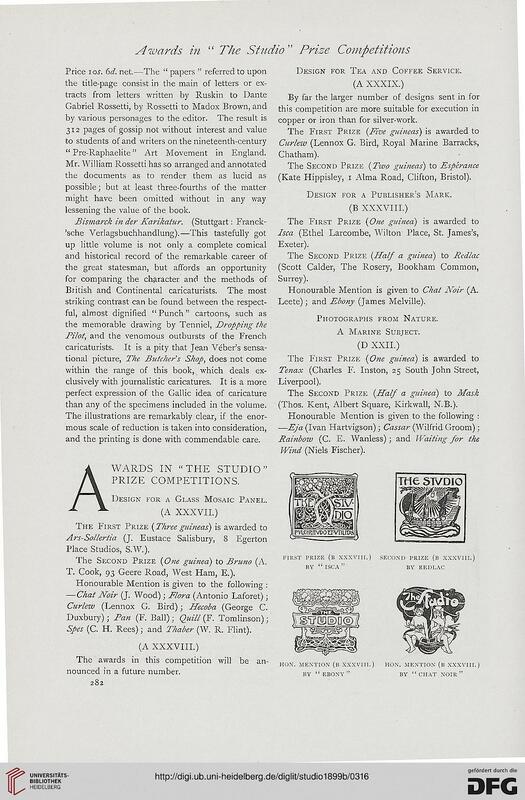 “ Pre-Raphaelite ” Art Movement in England. lessening the value of the book. than any of the specimens included in the volume. and the printing is done with commendable care. Design for a Glass Mosaic Panel. The Second Prize (One guinea) to Bruno (A.
T. Cook, 93 Geere Road, West Ham, E.). Curlew (Lennox G. Bird); Hecoba (George C.
Spes (C. H. Rees); and Timber (W. R. Flint). nounced in a future number. Design for Tea and Coffee Service. copper or iron than for silver-work. (Kate Hippisley, 1 Alma Road, Clifton, Bristol). Design for a Publisher’s Mark. Honourable Mention is given to Chat Noir (A.
Leete); and Ebony (James Melville). (Thos. Kent, Albert Square, Kirkwall, N.B. ).